2. You must first create a burr on both sides and then smooth it down with just one or two gentle movement of the finest sharpening stone that you have. To check if the blade is sharp, use your nail, put the blade with a vertical angle on it (beware: don't push it! Just keep it there! )and see if it gets stuck there (= the blade is sharp) or if it slides away (= the blade is blunt). In principle, sharpening a knife means removing metal from the blade's edge. You remove metal by grinding away the metal surface. Water helps making the abrasion caused by the movements of stone to metal more delicate and "soft", hence less deep inside the metal surface.So you should use progressive less coarser - or progressive finer stones - when sharpening. Two or three stone sizes should suffice for each kind of knives. So, let's say that you need to have a total of 4-5 stones in your workshop plus a ceramic stone or a polish tape perhaps to finish off: a medium coarse, a fine-stone, an extra-fine, a "600" stone. "Numbers" are country sensitive. The famous japanese honing stones (used for instance in the wonderful art of the Japanese "Samurai" swords - the "Takanas") are ranked by the "thousands". It's important to keep in mind the principle of "coarse", "medium", "fine", "extra fine" and so on, I think. 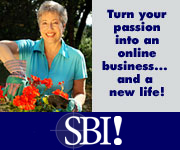 But if you want really much more, a community of home-based entrepreneurs, use Site build It!! No need to HTML coding, too. Copyright © 2010 - 2011. All rights reserved. This Website is Powered by Site Build It! - and I would never use anything else. Made with Dreamweaver - Learn How to Build Websites with Dreamweaver!